At about 3:30 p.m. Wednesday afternoon — at an Orlando airport rental car counter of all places– a Magic fan unbuttoned the top of his dress shirt to reveal a blue T-shirt emblazoned with a Superman logo underneath. The fan might have been keeping his super powers hidden, but after a lackluster performance in the first three games of the Eastern Conference Finals, the Orlando Magic are no longer hiding theirs. We know now that the Magic have the power to win games. But after the Celtics lost to the Magic 113-92 in Game 5 Wednesday night at Amway arena, it’s becoming distinctly possible that the Magic possess the ability to not only win this series, but to inflict pain on Boston in the process. The Celtics still hold a 3-2 lead, but the emotions of the series have shifted in Orlando’s direction. Emotions are a good place to start, and Celtics center Kendrick Perkins was at the center of it all in Game 5. Having already picked up a technical foul earlier in the second quarter, Perkins took issue with a foul whistled against him as he was guarding Dwight Howard with 36 seconds remaining in the first half. Perkins’s demonstrative disagreement with the call earned him another technical and an automatic ejection. As it was also his seventh technical foul of the playoffs, Perkins is by rule suspended for the team’s next game, barring one of his two technicals tonight being rescinded by the league office. Emotions weren’t the only problem for the Celtics. Health was also a major factor. With 23 seconds remaining in the third quarter, Glen Davis took an inadvertent elbow from Howard and crumbled to the floor. Davis was shaken up, but he heeded the pleas of coach Doc Rivers to get up and finish the play. As he tried to run down the court, Davis lost his balance and crumbled to the floor. He got up, stumbled past halfcourt, and fell into the arms of official Joey Crawford. Davis would be diagnosed with a concussion, leaving the Celtics two men short on their front line. An injury to Marquis Daniels early in the fourth quarter — confirmed by the Celtics as another concussion — only added to the bizarre quality of Game 5. And then there were the three-pointers. Stopping Jameer Nelson’s dribble penetration was something the Celtics worked on after Game 4, but Boston seemed to overcompensate for Nelson in the first half, helping too much on the Magic point guard’s drives and leaving shooters open. The Magic made 5 of 9 three-pointers in the first quarter and made their first two in the second quarter, extending their lead to 40-33 with 8:50 remaining in the first half. Orlando’s threes came off of Nelson’s dribble penetration but also from offensive rebounds, where the Magic caught the Celtics flat-footed in their recovery out to open shooters. The Magic would finish the game with 13 three-pointers, the most the Celtics have allowed to one opponent in any game this season. Nelson led the Magic with 24 points and 5 assists, while Howard finished with 21 points, 10 rebounds, and 5 blocks. The Celtics got a pleasant boost from Rasheed Wallace (21 points) off the bench, but Wallace would eventually foul out of the game, leaving the Celtics with no true center for the end of the game. It’s only one game, and the Celtics still do hold a 3-2 series lead with a chance to close out the Magic in Game 6 Friday night. It’s only one game, but somehow it feels like more. 3:46 4th quarter, Magic 107-88: Early word from the Celtics is that Marquis Daniels also has a concussion. 4:49 4th quarter, Magic 106-88: Rasheed Wallace picks up his sixth personal foul, and he crowd can’t get enough of it. 6:03 4th quarter, Magic 101-86: This one’s getting ugly, and the Magic are pounding their stats. Orlando is up to 54-percent shooting from the field. 8:59 4th quarter, Magic 91-78: Rashard Lewis is heating up. He’s got 10 points now as the Magic are starting to pull away. 10:31 4th quarter, Magic 87-78: This game keeps getting weirder. Marquis Daniels leaves with what appears to be a hand injury. End 3d quarter, Magic 84-74 This game is an emotional roller coaster, just not in the scoring department. The Magic are haven’t been threatened in the second half. But the game has taken a back seat to some bizarre happenings. The first was the ejection of Kendrick Perkins. The second came moments ago when Glen Davis appeared to catch an elbow from Dwight Howard. Davis fell to the floor, and as his coach motioned for him to get up, Davis tried but twice lost his balance, finally stumbling into the arms of referee Joey Crawford. Davis was down for several minutes before being helped off the court. If Davis can’t return — and it initially appears that he cannot — the Celtics are left very thin in the front court for the fourth quarter. This game might not be a bad result for the Celtics. It could be a disaster. 2:56 3d quarter, Magic 78-69: In case you missed it during the T.V. timeout, Rajon Rondo just got rung up for a technical foul of his own. 3:43 3d quarter, Magic 78-69: Glen Davis picks up his fourth foul. We might see Shelden Williams before this one is over. 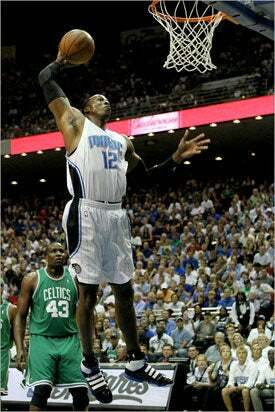 7:30 3d quarter, Magic 69-59: Dwight Howard fouls Paul Pierce, then throws Pierce down to the floor. Pierce remained down for almost a minute before walking back to the bench. Could be another reviewable hard foul on Howard. Halftime, Magic 57-49: What a turn of events in the final 90 seconds of the first half. Kendrick Perkins is gone, his second technical of the game sending him to the locker room early. Seeing as it was his 7th technical of the playoffs, he could also have a suspension for Game 6 barring either of his technicals tonight being rescinded. A huge, huge call in what has turned into a huge game. After all that, the Celtics are down eight despite Orlando hitting 11 of 16 three-pointers. Not that that stat is all that encouraging for Celtics fans. If the C’s don’t defend the three, they can’t win. 36.1 2d quarter, Magic 55-46: Second technical foul on Kendrick Perkins. He’s out of the game. Incredible for the Celtics to lose their starting center in the first half of a playoff game. 2:15 2d quarter, Magic 51-41: Kendrick Perkins picks up his 6th technical foul of the playoffs, leaving him one shy of a suspension. Not good. 2:55 2d quarter, Magic 51-39: Would you believe Rajon Rondo has 9 points and 4 assists? Sure doesn’t seem like it (he’d had 13 if he made his free throws, though). The Celtics aren’t playing horrendous offense, per se. They’re shooting 44 percent, which isn’t great but isn’t awful. It’s the defense of the three-pointer that is killing the Celtics. The Magic are shooting better from three (62 percent) than they are from inside the line (52 percent). 6:12 2d quarter, Magic 47-35: A three-pointer by J.J. Redick sends the Amway Arena crowd into a frenzy. 7:37 2d quarter, Magic 42-33: Rasheed Wallace sits down with three fouls. 8:50 2d quarter, Magic 40-33: The Magic are rolling now. Celtics need to do a better job getting out on Orlando’s shooters. Two more this quarter brings the Magic to 7 of 11 from behind the arc. End 1st quarter, Magic 31-27: Great start for the Magic. Orlando makes 5 of 9 three-pointers in the first quarter. This is the brand of basketball the Magic wanted to be playing. Paul Pierce has 10 points for the Celtics. 4:26 1st quarter, Magic 17-16: Two personal fouls on Rajon Rondo as well, but Rondo is staying in for now. 6:03 1st quarter, Tied at 12: Kevin Garnett sits down with two fouls, replaced by Glen Davis. 7:40 1st quarter, Magic 10-8: Rashard Lewis has five early points, including a surprising offensive rebound and putback. If Lewis can come through for the Magic they’ll be in great shape. 9:58 1st quarter, 5-0 Celtics: Strong help defense by the Celtics thus far, forcing the Magic into two turnovers early. Pregame: The Celtics came out of the tunnel with a little extra bounce in their step, with players forming a high-five line to a chorus of boos from the Amway Arena crowd. The Celtics are really embracing the role of the road team here. They don’t care if no one here wants them to win. Given their 5-2 road record during these playoffs, they might prefer it.